For most, Australia conjures up images of red desert dunes, burnt Outback plains, smoky olive bushland and dustbowl country towns. It’s a land of droughts and flooding rains, but when Australia is thought of, most of us think of the thirsty, parched Outback or harsh Red Centre, not lush tropics. Despite growing up in a major city in subtropical Queensland, these powerful, ubiquitous images of red, dusty plains were the first thing that came to mind when I thought of Australia. Red, dusty and dry Australia is magnificent but there is so much more to wild Australia than cracked plains and desert dunes. Tropical North Queensland and the Whitsundays are some of the best places in Australia to experience the country’s unadulterated natural splendor of an entirely different kind. Exploring the region is a chance to catch a glimpse of what the world looked like hundreds of millions of years ago and see species that exist nowhere else in the world. For a photographer, it’s a feast of blue and green in a million more shades than I had dreamed existed. The best beach in Australia is on the largest of the 74 islands in the Whitsundays archipelago, just off the coast of Airlie Beach. This isn’t biased opinion from a Queensland native – Whitehaven Beach is an uncontested national favorite. Whitsunday Island, like many other islands in the group, is uninhabited and delightfully undeveloped, so we visited on a day trip with Cruise Whitsundays. There are no lifeguards, no snack kiosks and no crowds. Once we hopped off the boat and waded up to the beach, there was nothing except for what nature intended. Whitehaven Beach is the proverbial black sheep of the Whitsundays Island, precisely because it is so white. Unlike its brothers and sisters, the sand on Whitehaven is made of silica, washed up over millions of years by unusual ocean currents. The result is a beach that is a blindingly bright white, yet doesn’t heat up in the sun. The water surrounding Whitehaven seems to sparkle with a thousand more shades of blue than usual. The water around the islands is dusted with a fine sediment which scatters sunlight for a remarkable effect. The Whitsunday Islands are part of the Great Barrier Reef World Heritage Area and are managed in partnership with the descendants of the Ngaro people, the traditional owners of the land. It’s the cleanest beach in Australia and among the most fiercely protected in the world, making it a great spot for landscape photography. 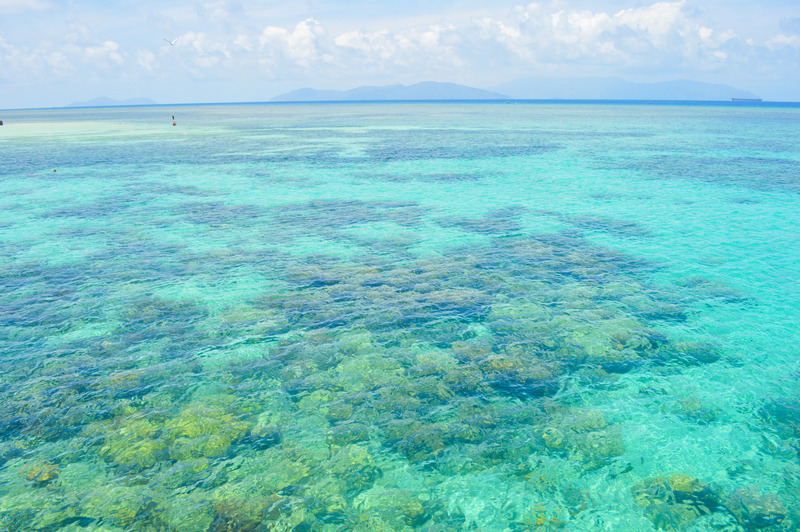 On Green Island, you can snorkel the Great Barrier Reef right from the beach. 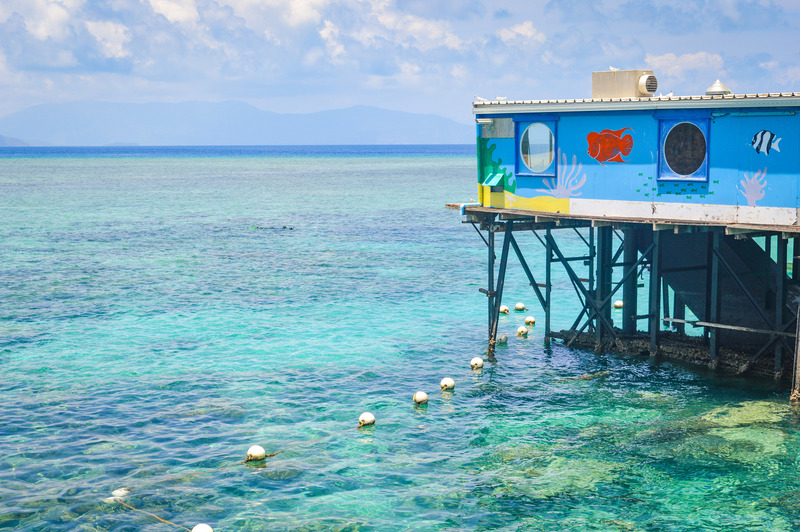 The coral cay sits within the Great Barrier Reef, and is so shallow, you can spend a day snorkeling the reef unsupervised. As we approached Green Island, I had to pinch myself. It’s exactly the way I always imagined a tropical island should look: a dense clump of rainforest fringed by a white, sandy beach, dunked in the middle of clear, warm waters. After disembarking from the boat, I stood on the jetty and could see nothing but shades of bright, clear blue, all the way to the horizon. 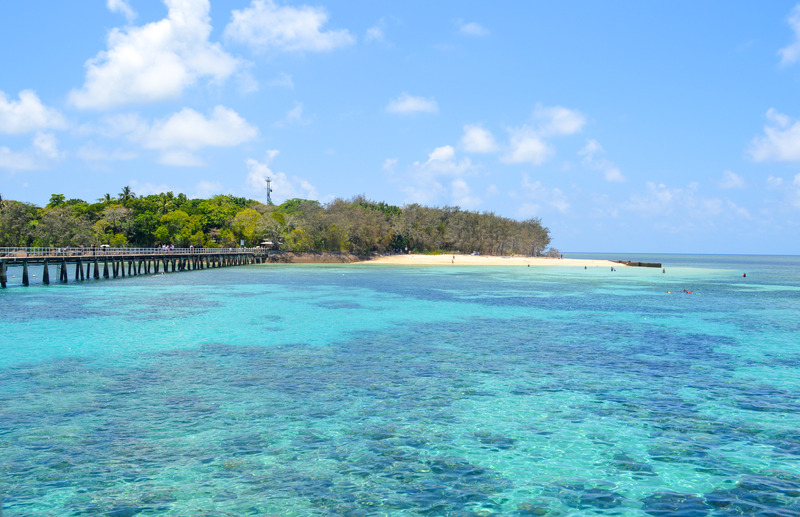 I think the natural beauty of Green Island and its surroundings are unparalleled, but when it comes to snorkelling there are better parts of the reef for seeing a greater diversity of wildlife, such as the Outer Reef Station. When my snorkelling is coming with a side of Green Island, however, I’ll sacrifice a few extra fish. Port Douglas is a popular holiday town and wedding destination, an hour’s drive north of Cairns. It’s smaller, quieter and more sophisticated than Cairns, with the price tag to match. 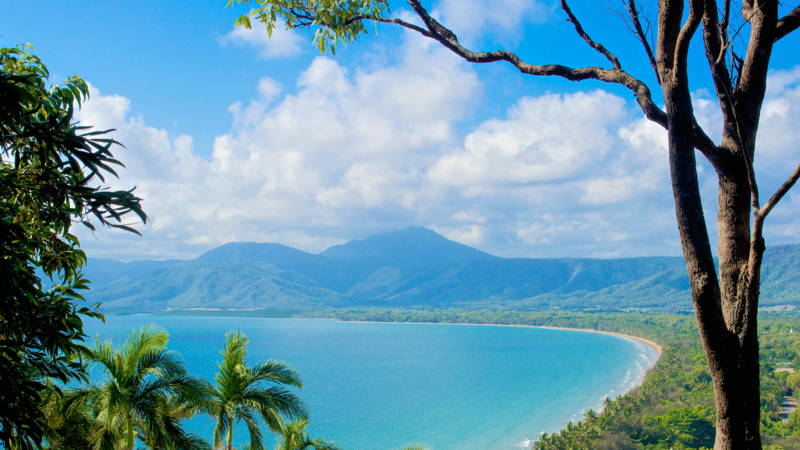 If you’re not staying in town, Port Douglas is a worthy detour on the drive up to the Daintree Rainforest and Cape Tribulation, even if just to see Four Mile Beach from Flagstaff Hill. 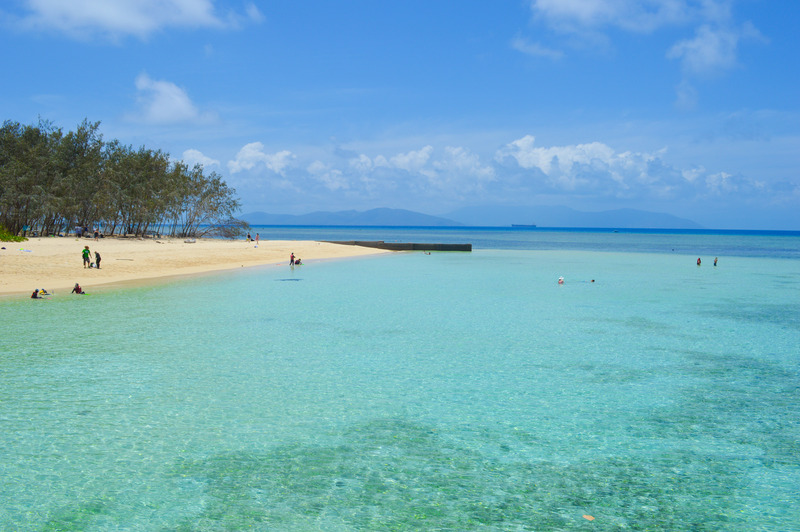 Four Mile Beach would be the poster child for the entire region if it wasn’t also home to the Great Barrier Reef and the oldest living rainforest in the world. Anywhere else, Four Mile Beach would be plastered on every postcard, website, banner and billboard. Despite living in Australia my entire life, when I stood at the top of Flagstaff Hill, I could have sworn I’d left the country – had a few gum trees not given the game away. Four Mile Beach sweeps along the coast, surrounded by mountains blanketed in dense rainforest, dusted by low-lying clouds. Once again, I was struck by Tropical North Queensland’s predominant color scheme of rich blues and greens. There is hardly room for anything else in this part of Queensland. Australia has a reputation as being home to some of the deadliest creatures in the world, but the greatest danger I faced while traveling through Tropical North Queensland was, believe it or not, a plant. I was in the Daintree Rainforest, the oldest living rainforest in the world, discovering that you don’t survive for 100-180 million years without having a few self-defense mechanisms. Our Daintree Eco Guide’s first rule for the rainforest was simple: Don’t touch anything. It is good common sense in general in the wild, but it’s particularly important in the Daintree because the walking paths are dotted with the rainforest’s most dangerous plant, the Stinging Tree. The serrated edges of the pretty, heart-shaped leaves are covered with fine hairs made of silica, the chief compound in glass and are laced with venom. There is no antidote. Fortunately, with a little awareness the Stinging Tree, and any other potential dangers, are easily avoided. I didn’t feel unsafe, but rather, in total awe of the power, ferocity and beauty of nature. Cape Tribulation is the only place in the world where two UNESCO World Heritage Listed locations collide. It’s the site where the world’s biggest natural structure meets the world’s oldest rainforest, as the Great Barrier Reef meets the Daintree Rainforest. When Captain James Cook discovered Cape Tribulation in 1770, he scraped and badly damaged his ship, The Endeavour, on a reef near the Cape. Frustrated with the rugged terrain, he named the Cape accordingly. Evidently, his mood didn’t improve before he named the surrounding mountains; Mt Sorrow and Mt Disappointment. I had a more fortunate experience, under very different circumstances. My first glimpse of Cape Tribulation was from the Mt Alexandra Lookout, where you can appreciate the full impact of the Great Barrier Reef and the Daintree Rainforest rush to meet each other in a riot of blues and greens. Even after a week of being spoiled with a rich color palette of blues and green, this view over Cape Tribulation was one of my favorites to photograph. Looking over the ancient Daintree feels like looking back in time, without a single scrap of evidence of human interference. From the second I set eyes on Cape Tribulation, I had a new visual definition of Australia. My exploration of the paradise that is the Queensland coastline left me in awe. Never had I seen such lush and colorful landscapes, and to have them exist in the island country known mainly for it’s dry and dusty outback made me realize that you should never judge a book by it’s cover, especially when traveling. See more from Genevieve Hassall on her website, Instagram, and Facebook.